Sometimes my Boyfriend actually pays attention to the hints I drop around my birthday and Christmas. He scored brownie points on Christmas day when he gave me a Melvita Discovery Kit. For those not familiar with Melvita, it is one of France’s leading natural and organic cosmetic brands. Natural beauty lovers will be pleased to hear that Melvita products do not contain paraffin, silicone, PEG (polyethylene glycol), PPG (polypropylene glycol), ethoxylated products, parabens, phenoxyethanol, formaldehyde, chlorine derivatives, synthetic fragrances or colouring agent, di-ethyl phthalate, nitromusk. The Delicate Skin Discover kit contains - Cleansing Micellar Water 35 ml, Rose Nectar Day Cream 15 ml and Nectar Night Cream 15 ml. All the products have a delicate hint of fragrance and feel gentle and soothing on the skin. If you prefer cleansing water then I highly recommend this one. Whilst it is not my preferred method of cleansing, I still have enjoyed using it. It is refreshing, soothing and does not leave skin feeling tight. I adore the creams. They are the perfect consistency (not runny or heavy) and my skin absorbs them easily. Even though the products are trial size there is ample for a week, in fact I may have got two weeks out of the creams (I wasn't monitoring). Overall, I am very impressed and would like to try more Melvita products. This Kit retails for £12.50 (other sets are available). If I was to purchase regular sizes of the products the Micellar Water is £13 (200ml), Day cream £24 (50ml) & Night cream £26 (50ml). I do not incorporate a night cream into my current routine as I find them expensive. If you decided to invest in full sizes, I feel as if these products are interchangeable so do not feel obliged to purchase them together. Have you tried Melvita? What did you think? Yes, the perfect size to try as there is enough product to decide if they suit your skin. Also good size for a week/weekend away. Ill have to get my girlfriend some of this and hope she likes it! Now following! I guess since you are in the US it probably would be more expensive as it's a French brand, here I would say it's about average but would not suit all budgets. Well done to your boyfriend for taking the hint! 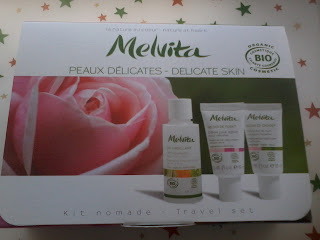 I haven’t tried Melvita, not sure why as I am aware of them and I do prefer to use more natural products. The day cream sounds good. I definitely recommend. Both creams are great but it terms of my budget I would invest in the day cream.